I haven’t been blogging much lately because I’ve been fiction writing. The last week in June, I participated in the Paris Writers’ Workshop. It was a fabulous experience, one of those that changes you just so slightly and leaves you feeling inspired. I learned quite a bit during the five-day workshop (from the “nuts and bolts” of being a writer today to new approaches to critiquing fellow writers’ manuscripts). I left with a sense of feeling a part of the worldwide network of writers and was eager to get to work on polishing a short story I’ve been working on. Now I’m back in the blogosphere – eager to share this article with you. It’s the story of a young Frenchman, Adrien Gontier, who set out to live without palm oil for an entire year. One of his primary reasons was to speak against the massive deforestation in Indonesia and Malaysia. The article explains that his year was successful, but not as easy as one might think. Palm oil has been the bane of my existence this year as well. Like Adrien I’ve discovered that it is hidden in countless products. Even at the natural health food stores you’ll find palm oil in everything from cookies to vegetable stock. I feel like I’ve been doing a pretty good job at getting palm oil out of our cupboards. I’ve even managed to find crackers and biscottes (those small crunchy breakfast breads that are so prevalent in France and Sébastien can’t live without). 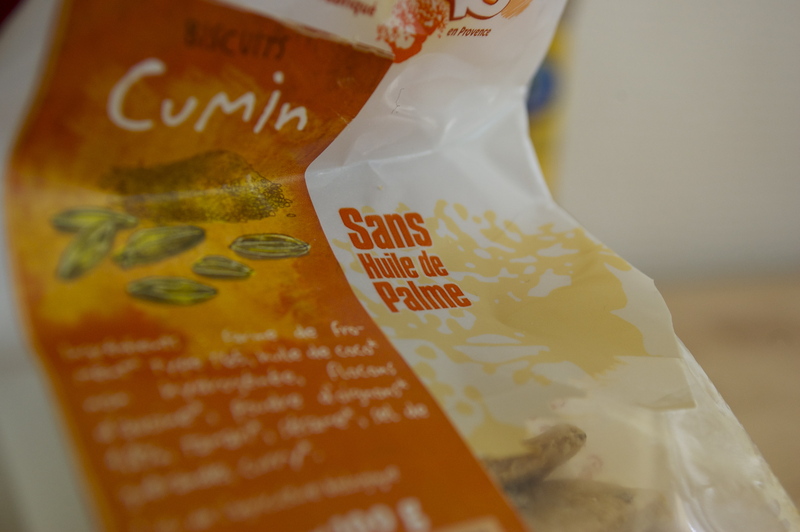 I’ve been munching on Dao organic cumin crackers this week and Sébastien has gladly accepted that Le Moulin du Pivert’s spelt biscottes replace his old favorites. I’ve begun making basics like vegetable stock from scratch instead of buying the cubes – or, on a busy day, simply doing without. It takes a bit more effort to read labels and make certain edibles from scratch, but we don’t miss the palm oil one bit. What I hadn’t realized before reading Adrien’s blog was how present palm oil is in non-food items such as cosmetics and cleaning products. The reason I didn’t realize this is that it can be hidden under other names. Visit his blog for a rather complete list of other names palm oil can be disguised under. While “vegetable oils” didn’t fool me on food labels, sodium lauryl sulfate on shampoo bottles certainly did. It is often derived from palm oil. The scary thing is, you don’t actually know by just reading the label. We already use charcoal-based laundry soap and the most basic household cleaning products, but I’m afraid to look at the rest of the seemingly innocent products around the house. This entry was posted in Everyday Life in Paris, Healthy Living and tagged writing. Bookmark the permalink. FANTASTIC! Thank you for letting us all know about this common defacing of the palm tree from our forests. We must all read more labels and clean up our own use of this wonderful tree. Did you come across any blogs/articles in English? Thanks. If you’re trying to do without palm oil for environmental or animal-cruelty reasons, it might be very hard to find a substitute for certain items. Margarine is a case in point. Certainly butter or any margarine with dairy would not suffice, since animal farming is a leading cause of greenhouse emissions worldwide and involves a great deal of animal suffering. Maybe using pure olive oil or making our own margarine would be the answer.